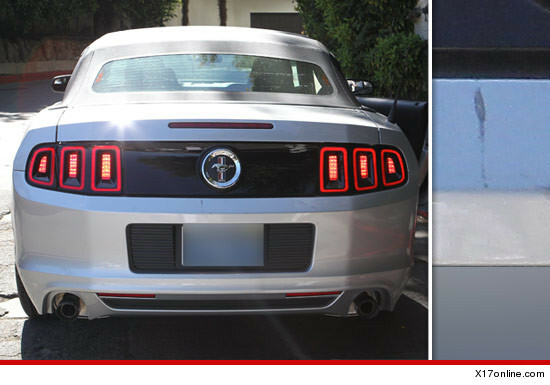 Lindsay Lohan Another Day ... Another FENDER BENDER! Call Guinness ... Lindsay Lohan was just involved in her 5,412th car accident -- but luckily, this one didn't require tow trucks or ambulances. Here's the blow-by-blow: accident-prone Lindsay chose to get behind the wheel of her black Porsche Panamera after a shopping trip in Bev Hills this afternoon. A short while later, while cruising down Sunset Boulevard, Lindsay tapped the back of a silver Mustang ... that wasn't moving. A woman in the Mustang says, "We were sitting at a light and somebody hit us." The woman says a male passenger in Lindsay's car apologized and left his phone number ... before telling her they had to keep going because paparazzi were following them. The Mustang's damage appears to be extremely minor and cosmetic. It's unknown if Lindsay's car suffered any bumps or dings.